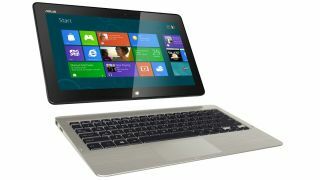 Asus has outed its first Windows 8 tablets at Computex in the form of the Tablet 600 and Tablet 810. Both tablets come with the familiar Transformer keyboard dock, allowing you to jump from touchscreen tab to QWERTY keys netbook in no time – something which should fit naturally with Mircosoft's Windows 8 platform. It looks like Asus is keeping the Transformer branding for its Android offerings, with the Windows powered devices getting stuck with the more mainstream Tablet label. The Tablet 600 runs Windows RT – a tuned version of the Window 8 platform to work specifically with devices running ARM-based chips, leading us onto the quad-core Tegra 3 processor housed underneath the Tablet 600's 10.1-inch (1366 x 768) Super IPS+ display. You'll also get 2GB of RAM, 32GB of internal storage, an 8MP rear camera with LED flash, 2MP front snapper, Wi-Fi, Bluetooth 4.0. GPS, micro HDMI and SD card slots and NFC technology in the Asus Tablet 600. The Tablet 810 is a slightly different offering, as it packs an Intel Medfield processor, which means it can run the full version of Windows 8. You also get a larger display, with the Asus Tablet 810 offering an 11.6-inch display, with the same technology and resolution as the Tablet 600. Storage has been doubled to 64GB, while RAM remains at 2GB, but an added bonus with the Tablet 810 is its support for a Wacom digitizer pen – which offers a more advanced method of stylus input. There's currently no word on release date or prices for these tablets, but we'd expect them to go on sale around the same time as Windows 8 is officially released – probably in October.